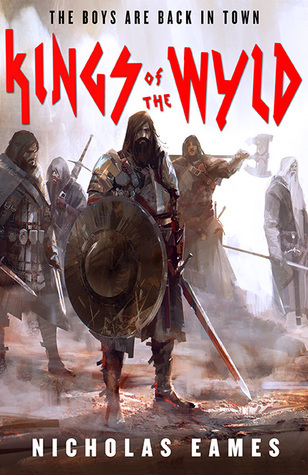 This is a review of “The Kings of the Wyld” by Nicholas Eames. Clay Cooper and his band were once the best of the best, the most feared and renowned crew of mercenaries this side of the Heartwyld. Their glory days long past, the mercs have grown apart and grown old, fat, drunk or a combination of the three. Then an ex-bandmate turns up at Clay’s door with a plea for help – the kind of mission that only the very brave or the very stupid would sign up for. It’s time to get the band back together. Clay Cooper’s relationship with his wife and his daughter was wonderful to read about. It isn’t often that ex-mercenaries get a happy ending like that when it comes to family. Ginny is also obviously a strong woman who won’t stand for nonsense, but she is also gentle and kind to her child and to her husband. She had the fortitude and strength to help soothe the beast, and still does it. Little Tally is sweet and likable, too. Moog’s husband and the discovery of the cure was bittersweet and touching. Mattrick actually being a good king and a good father with kids who like him better than their mother, was well done. Gabriel and Rose’s relationship was definitely a pleasure to read about and not stereotypical at all. Ganelon’s choice at the end of the book was surprisingly sweet yet also fits in with his character, though his entire story arch was a bit of a disappointment all around. The world that is the setting for the book is vast and expansive and very detailed. The terrain is varied, and travel from one place to the next takes the appropriate amount of time. There are countless types of creatures out there, there is always something new to discover. Every creature ever imagined in folklore or in D&D is hinted at, met, or mentioned in passing, and one really gets the sense that there is more to discover about this world. The secondary characters were all very well developed and interesting. The druins themselves make me think of the Viera from Final Fantasy XII, but not in bad way. Lastleaf was an excellent character, and he avoided the pitfalls of stereotype perfectly. The story behind his quest for revenge was actually a bit of a surprise, and very much understandable, which is why his death in the end just kind of sucked. Unfortunately this book suffers under quite a few drawbacks. The narration sometimes jumps into omniscient, and there is a surprising lack of fighting. Throw in some odd moments of exposition or reflection thrown in just to make time pass or to avoid listening to conversations, and it slows the story down. There is also a surprising lack of the troubles old men who led a rough life might face when forcing their bodies to do things – although, I have seen worse. One third of the book was given over to getting the old band together, the next part was given over to finally getting somewhere, and then the final part was about actually crossing the Wyld and saving the day. For a book that makes such a huge thing out of the Wyld and how far away everything is, our band of heroes has little to no problem actually crossing it in a timely manner. They don’t have much trouble at all, and it happens so quickly that it is a bit of a let down. What also annoyed me was the way things went far too smoothly for the band of heroes. Need fast transport? Get a skyship. They aren’t as rare as they were made out to be. They crash in the middle of the Wyld? Well, this friendly troll will heal you and this friendly tribe of cannibals will lead you out after a short skirmish. Get your hand chopped off? You’re in luck! There’s a giant spider healer who knows how to regrow limbs. It keeps on going. They don’t suffer and there’s always someone or something placed perfectly in their path to help them onwards. As for the personalities of the illustrious heroes, well, it leaves a lot to be desired. All of them are alike, none of them really get the chance to develop and become familiar. They are stock characters from D&D: thief, mage, swordsman, berserker, tank. The book is written as an action adventure, but even so there could have been better character development. Couple that with the aforementioned annoyance that something always happens to help them out, and there is a lot of tenseness and thrill removed from the story. All in all, this is an alright book with occasionally amusing humour. It is a quick read and the action scenes are good, but it isn’t really anything special.